Woah.. tough choice but I'm going to go with Winter's Bone. Edges out Animal Kingdom just because of its amazing emotional core. This year brought us two fantastic, gritty, realistic films deeply ingrained in criminal families. I loved the psychotic levels of machismo to mask real fear in AK, but Winter's Bone is clearly superior to me. It captures an entire subculture with startling clarity, and has arguably the two best performances of the year by Jennifer Lawrence and John Hawkes. 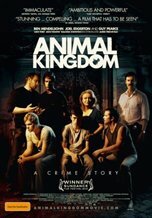 Animal Kingdom wins barely, if only because the narrative was more enthralling for me (something that barely ever divides two films for me, which I hope explains how close these films are in my book). This one is really tough. Both films fulfill a similar role for me. I just liked Animal Kingdom more.